Professor Jane Rendall is this year’s winner of the History and Theory category of the RIBA President’s Awards for Research, with work from her most recent book The Architecture of Psychoanalysis. Jane’s research uses psychoanalysis as a theoretical tool for interpreting architecture and demonstrates how a knowledge of psychic processes can help to understand the design and use of buildings. Dr Kostas Grigoriadis is the winner of the Design and Technical category, with his work on Computational Blends: The Epistemology of Designing with Functionally Graded Materials. His research proposes a novel method of designing with a type of material that is known as multi-, or functionally-graded (FGM). Bartlett tutors Dr David Roberts and Huda Tayob also received commendations for their research in the Cities and Community and Ethics and Sustainable Development categories respectively. David’s research Reflect Critically and Act Fearlessly investigates the ethical dimensions of the built environment professions and Huda’s explores the urban spatial practices of refugee markets in Cape Town from 1990 – present. The RIBA President’s Medal for Research was this year awarded to Bartlett alumnus, Chris Hildrey of Hildrey Studio, for ProxyAddress: Using Location Data to Reconnect Those Facing Homelessness with Support Services. Chris is a graduate from the school’s Postgraduate Certificate in Advanced Architectural Research. 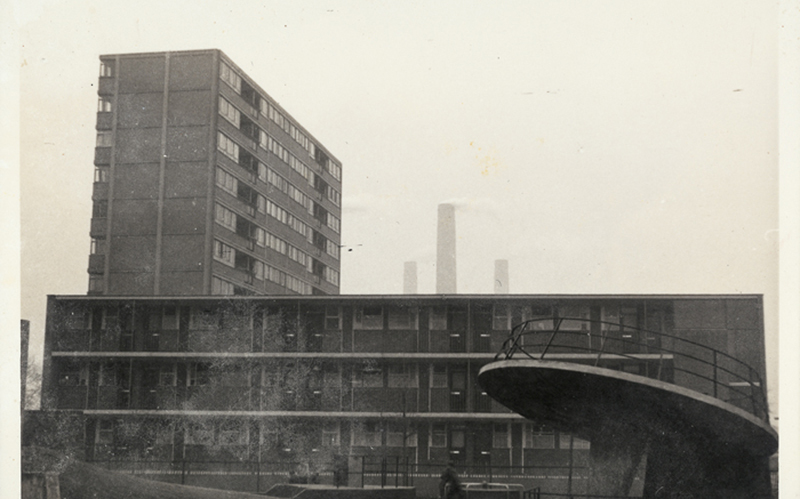 Image: Churchill Gardens (1950-1962), designed by Powell and Moya for Westminster City Council. Salvaged photograph. Find out more about this year’s RIBA Awards for Research.